It is the year 2005. The treacherous Decepticons have conquered the Autobot’s home planet of Cybertron. But, from secret staging grounds on two of Cybertron’s moons, the valiant Autobots prepare to retake their home land. How much more of an introduction do you want? We have a short and simple explanation of everything we need to know right at the opening. Actually, I lie. That introduction comes after the opening credits. Prior to that, we’re treated to an awesome display of carnage as the planet Unicron swoops down and quite literally devours another planet full of peaceful, happy robots, and their peaceful, happy robot children. Don’t bother wondering why or how these robots have children, because they’re all dead within the first five minutes of the movie. Now how many films, let alone kid’s films, begin with the eradication of an entire planet? Right at the outset, this film establishes an epic scope, and the rest of the film lives up to it admirably. Even beyond having a carnivorous planet, the war between the Autobots and Decepticons rages to new heights as a simple supply run to Earth quickly turns into a massacre, killing off several primary characters from the TV series. It may not have as much impact on strangers to the franchise, but fans knew for certain this movie meant business when such a staple character as Ironhide got wasted. 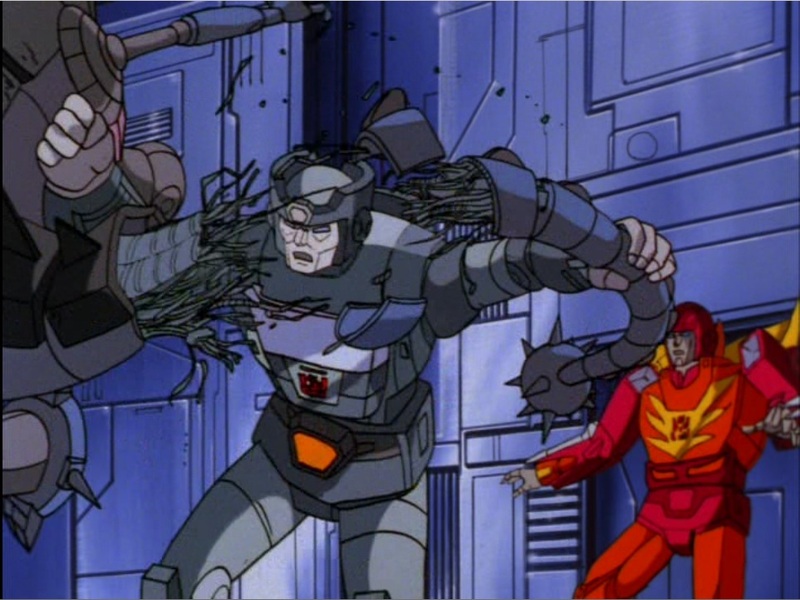 Transformers has to be the most violent children’s films ever made. It gets away with characters getting shot full of holes, dismembered, eaten alive, crushed under foot, and dropped into vats of acid. You sure aren’t going to see that kind of action in Wall-E or How to Train Your Dragon. Because the Transformers are robots, having them explode doesn’t count as gore, and the crew took every liberty they could with that loophole. To fill the missing spots, and make use of its star-studded cast, the movie introduced a host of new characters that immediately became fan favorites of the franchise. If they look goofy and weird to you, keep in mind that this was set 20 years in the future, the year 2005. Don’t blame the Transformers for looking odd, blame GM for not making elongated, streamlined, neon-colored convertibles by now; those cars should have come out years ago. One of the things I love about this film is how natural the transforming feels. The characters bounce back and forth between their forms without thought or hesitation. It’s as if they really were born (or created) to transform, and it is every bit as natural to them as walking is to us. At this point everyone knows what Transformers are. Any scene making a big deal about transforming would have been a boring waste of time. Instead, the action scenes make as much use of the transformations as they can to make the battles flexible and creative. 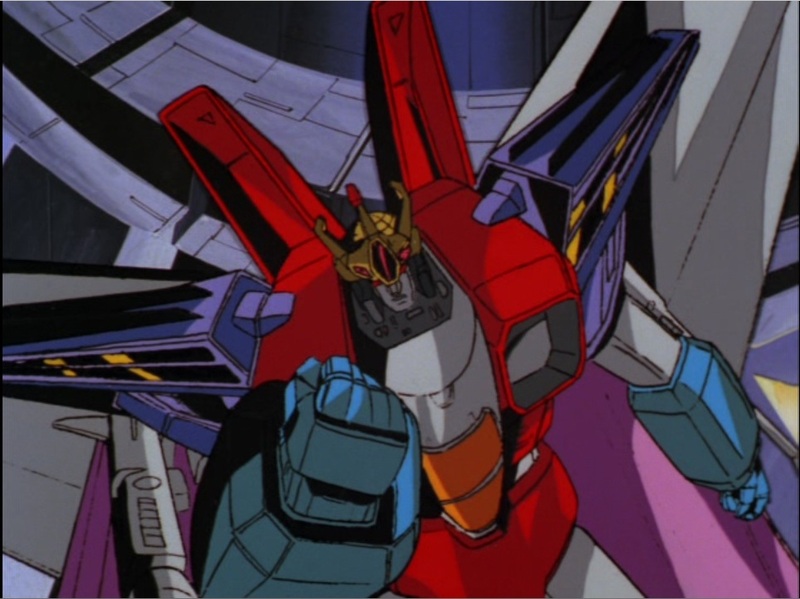 It culminates in a superb showdown between Hot Rod and Galvatron at the end of the film, where both characters use their different forms throughout the fight to great effect. You can feel free to be skeptical of my love for this film. After all, how objective can I be toward my favorite childhood movie? Probably not much. But I’m going to try my best anyway. And I think there really is a lot of good content here. There’s a lovely prison planet for starters. It’s run by a bunch of lunatics that execute people for being innocent. But that’s just the tip of the iceberg. I already mentioned Unicron eating other planets, but he also uses some strange magic powers to revive an army of demonic/undead Transformers. Yes, you read that right. This movie has zombie robots. The mind boggles. You may have also realized that Unicron is not some mindless force of destruction, but an intelligent being with his own objectives. And he is voiced perfectly by Orson Welles in his final film role. Welles in fact died only a few months after the recording, before the film even released. Apparently he was rather sickly at the time, and it took a bit of audio filtering to change his voice from gaspy and wheezy into the thunderous, booming voice of Unicron. Complain all you like about it being fake, but damn it, it worked. The foreboding dread his voice creates is incredible. In general, most of the voices in this movie are filtered to sound more robotic. 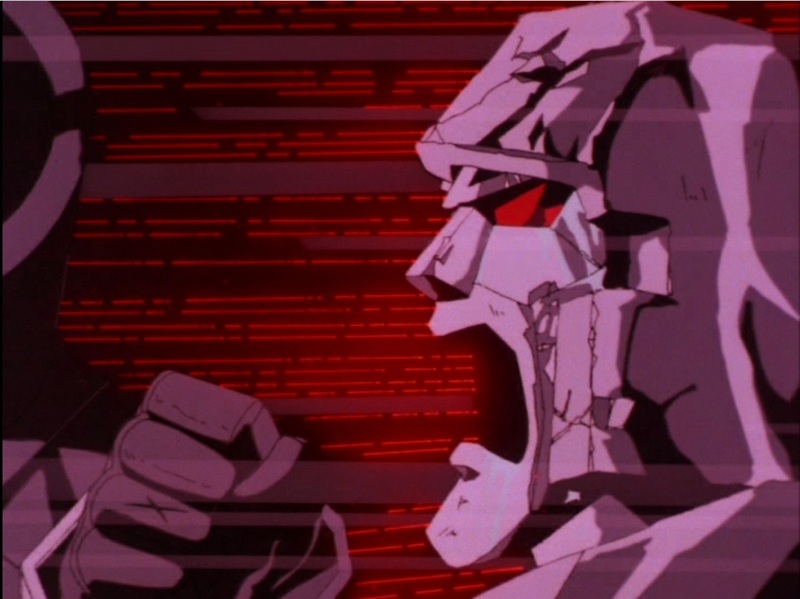 It can cause some indecipherable dialog at times, but it just wouldn’t be Transformers without those vocal effects. The acting all around is superb. Every one of the performances fits perfectly with the character, and there’s a lot of good talent here in case you skipped the list of actors at the top of this review. I want to point out Leonard Nimoy as my favorite, though. His character is one of the most fearsome sounding villains I have ever heard. You normally only think of him in the dry, emotionless role of Spock, but Transformers is a whole different story. I wish he had been cast as a villain more often, because he really delivers the goods here. And should I bring up the directing? I always feel incompetent to judge the finer points of film craft, but I’m pretty confident about this one. It’s brilliant. Every scene feels dynamic and intense, squeezing in every drop of excitement that can fit. It even gives punching buttons on a computer terminal a sense of urgency. I’ve been raving about this film for a while now, but I did promise to be as objective as I could. So I’m going to try and point out some flaws with the film, although they honestly don’t feel much like flaws to me. The first and most obvious would be the animation, which is far from amazing, but it is also far from the crap present in the TV series. 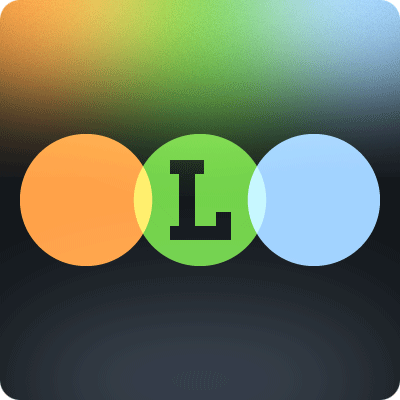 It doesn’t hold up to more “serious” animation, but it works well enough. There is also a very distorted sense of size. Part of this is simply that when showing a conversation between a person (or robot) and a planet-eating monster you’re going to have problems showing both at the same time. Interactions with Unicron are always a little out of scale. Actually they are a lot out of scale. I can see this bugging people, but for the sake of narrative flow, if nothing else, the scenes still work and create a dramatic effect. Besides, Transformers has always had a screwy sense of scale. 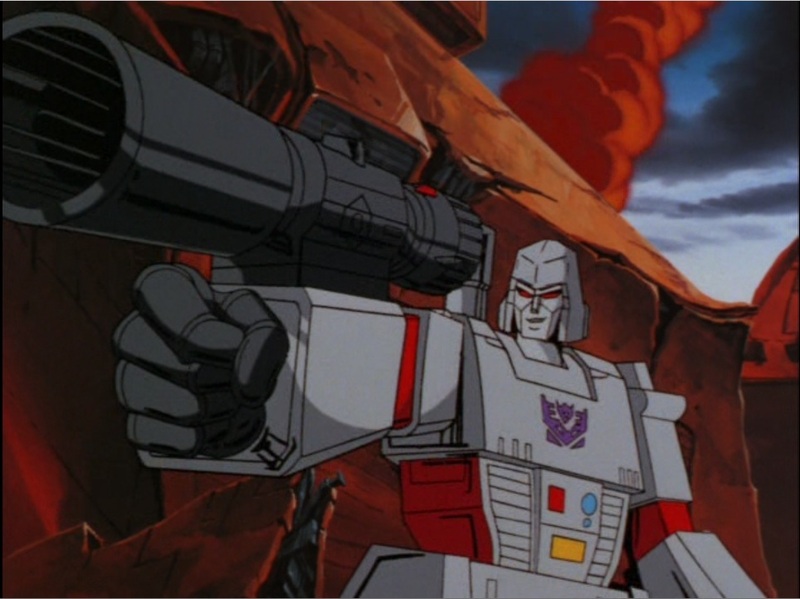 Megatron transforms into a handgun that other characters can wield, and can even shrink down to the size of a human gun. Blaster and Soundwave both turn into cassette decks. Cyclonus transforms into Galvatron’s personal starfighter, which leads to one of my favorite scenes as Galvatron hops out of the cockpit and Cyclonus transforms and walks up behind him, suddenly almost the same height. Size changing is such a staple of the ’80s era Transformers that one more goofy scale issue is hardly worth worrying about. Others might complain about the breakneck pacing. This was a movie designed for children and their notoriously limited attention span. The movie whips from action scene to action scene with hardly a pause in between. As an adult, it does feel too rushed, but as a child it was thoroughly engrossing, and I can hardly find fault with crafting a film to please its target audience. Besides, if I had to make a choice between too fast and too slow pacing, my money is always going on fast. Also related to being a children’s film is that some of the comic relief characters can be pretty annoying, especially Wheelie. I suspect Grimlock will get on some people’s nerves as well. They are far too engrained into my childhood to ever hate them, but I can at least recognize that my nostalgia is at work here. Fortunately, they are nowhere near as pervasive as Jar-Jar was in Phantom Menace. You’ll have a few scenes of irritation, but the film always has bigger and better things to get on with. Why am I even talking about such minor issues? Transformers has interstellar warfare, a prison planet run by a psychotic judicial system, an army of undead Transformers, and an entire freaking planet as the main villain. And it’s all tied together by excellent directing and excellent acting. Man, I haven’t even mentioned the totally bitchin’ rock soundtrack that fills nearly every scene with pure awesome. What more could you ever possibly want from a movie? Futures Passed continues tomorrow with two brothers doing their best to survive in the post-earthquake LA wasteland. Any guesses? Such a memorable film from my childhood. Just watching the trailer brings back goosebumps – I’ll have to track down the full feature and give it another go…. Ahh, the memories…. Yeah, I practically lived on this movie as a kid, and it’s still a ton of fun. I have something of a different history with the film than you guys. I watched the show relentlessly in my youth, but during those years where I don’t really remember anything about the show now, just that I watched it. Same thing with Airwolf. Anyway, around that time I also saw the movie, but I didn’t remember it. Then I turned 20 or so and decided to get nostalgic, so I bought the DVD. Coming at it without any real memories of the Transformers, it was a definite hard sell, but I still really enjoyed it. I still find some of the soundtrack choices just insane, but as with any ’80s movie, that’s part of the charm. I also wanted to say that I really enjoyed reading your review as your excitement and love of the film comes through quite well. As someone with such a strong passion for the art of film, it always warms my heart to read another’s words about something so dear to them. I got worried when you said you were going to try and spot flaws, but I was glad to see you addressed them and proved why they weren’t really flaws. Good stuff. Yeah, think the movie will lose something if you don’t have that nostalgia going for it, but there’s so much crazy action in it I can’t imagine someone outright hating it. I really do love that soundtrack. The movie just wouldn’t be the same without it. I had the soundtrack as a kid and listened to it all the time. It’s still the first thing I think of whenever I think about ’80s rock. I’m glad you enjoyed the review. I was a little worried about coming across as a blithering fanboy whose opinions hardly matter. Trying to balance that with my complete love of this movie was kinda tricky, so I’m happy it turned out well. My goal with all my reviews is to point out a mixture of good and bad, even if it’s not something that I agree with. I try to point out things that might upset other people, that way readers can make their own decision about what they might like or not in the film. I think that’s especially important in my reviews since I don’t use a specific rating system. Anyway, because of that, even if I love the film I try and figure out what might fall flat for someone. And if I hate the film, I still try to find something that someone might find redeeming about it. It’s not that there are flaws in Transformers; it’s that someone might have trouble accepting certain aspects of it. Wow, that’s a fair way to approach reviews! I just shoot from the hip and hope for the best! I do think it’s smart of you to have goals, though, and I agree that it’s especially important because you aren’t awarding scores to movies. Well, I can’t say that I actually succeed at it, but that’s the underlying philosophy I try to follow when I remember to. I still need to check out The Hobbit, but other fantasy fans I know tell me it’s fantastic, so you’re not alone in your love for that one. Well I say keep doing it how you do, cuz it seems to be working. Hopefully you’ll also like The Hobbit. I should just stop reading reviews of it from people who didn’t like it. I have a morbid fascination with understanding why they don’t like it. It amazes me how today’s motion pictures lack the quality soundtrack of this 1986 animated film. As for its level of violence, Asian kids have been exposed to “anime level of violence for decades.” They would not bat an eyelash when they see Brawn, Prowl, Ratchet, Ironhide, Optimus Primes, a Sweep, Arblus, Kranix, Sharktacons, Reflector, and Unicron “fall.” Obviously, this is another STAR WARS-CLONE, but one that is streamlined to do away with any lulls and fillers. It is a 10/10 film for me, in terms of overall re-watch value. I can always sit down for this film. It has so many great moments. I did hear from an interview with the composer, Vince DiCola, that he was deliberately avoiding the more common symphony soundtracks that other films use. It definitely stands out, and I still listen to it all the time. Violence-wise, I think it’s not just that there is so much violence in it, but that it happened to people that were such staples of the TV series. 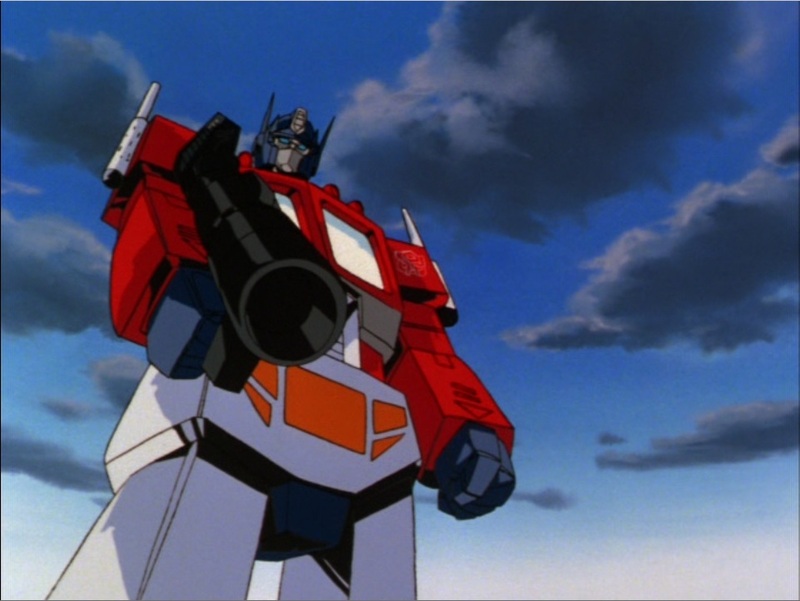 It wasn’t that someone died, it was that Optimus Prime of all people died. But since the film didn’t get released in Japan for years, the Japanese audience would have probably already known most of the character deaths by then anyway and wouldn’t have been as shocked as the American audiences. I’ve actually never really thought of it as a Star Wars clone. I guess there’s the obvious light saber that pops out of nowhere for about five seconds. You could call Unicron a parallel to the Death Star, but I’ve never really thought of them as having the same story or similar characters. I actually felt it draws more from the Galaxy Express films, at least in terms of visuals. Unicron’s death and the battle at Autobot city looked very similar to Galaxy Express at times.